Negotiations over another UN Human Rights Council resolution on Sri Lanka are ongoing, with many issues unresolved. The 30th session of the UN Human Rights Council (HRC) began over a week ago, yet much about the U.S.-led resolution on Sri Lanka remains undecided. The U.S. hopes to pass a consensus resolution that has Colombo’s clear endorsement. Is that how things will play out? When it comes to Sri Lanka’s fate at the Geneva-based HRC, this time was supposed to be different. Since 2012, three U.S.-led resolutions on Sri Lanka have been passed at the HRC. Former Sri Lankan President Mahinda Rajapaksa, who ruled from November 2005 until January of this year, rejected those resolutions. Still, since Rajapaksa’s ouster in January, Colombo’s foreign policy has been shifting. During this session of the HRC, the island nation is not coming under the same type of pressure that it had over the past several years. However, that doesn’t mean that events have become a foregone conclusion. Indeed, negotiations over the content of the imminent resolution on Sri Lanka are far from over. During an informal meeting on September 21, Colombo made it clear that they do not approve of the draft resolution in its current form. This is not shocking news, especially since Sri Lanka’s new administration has to consider the domestic ramifications of what happens in Geneva. Hectic backroom consultations and lobbying commenced inside the UN building in Geneva soon after the informal session ended. Sections of the international community are strongly urging the main sponsors of the resolution to water down the document’s language, lest it creates a backlash in Colombo, with nationalist forces mobilizing support against international interference. These diplomatic envoys argue that the new Government in Sri Lanka could be weakened by forces aligned to former President Mahinda Rajapaksa and his close allies if intrusive language is included in the draft resolution, Daily FT learns. The U.S. is in a difficult position. For starters, the Obama administration wanted to get a consensus resolution on Sri Lanka through the HRC. By making this point clear well before the 30th session began, Washington has lost some leverage with Sri Lanka (and other countries) as it tries to finalize the contents of the resolution. More generally, the U.S. has frustrated some people with its embrace of the Sirisena administration and concomitant willingness to accept Colombo’s plans for a purely domestic accountability mechanism, especially since Sri Lanka’s Tamil community has no faith in a domestic process. In a lengthy statement issued on September 22, Rajapaksa stated that the Sri Lanka government should reject the recently released UN Office of the High Commissioner for Human Rights (OHCHR) report on Sri Lanka. It’s unsurprising that Rajapaksa would try to use such an occasion for domestic political gain and the concerns about a Rajapaksa resurgence are not baseless. Even so, what’s needed now is strong leadership and political will. The current draft resolution does not mention the possibility of a hybrid accountability mechanism. When viewed in that light, one could argue that it does not go far enough – that the language should be even stronger and more clear. More broadly, the resolution in its current form contains several useful points as it relates to reforms, although a more detailed roadmap vis-à-vis transitional justice seems necessary. But is getting a stronger resolution through the HRC possible at this point? With the resolution set to be tabled this Thursday, time is of the essence. At this point, it’s crucial to emphasize that the situation in Geneva remains fluid and that plenty could happen in the next few days. 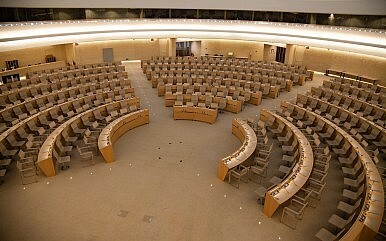 In order for the Obama administration to preserve some of its credibility regarding accountability, justice, and the pursuit of genuine peace in Sri Lanka, it’s imperative that a strong resolution – that includes clear language, thorough reporting requirements, and substantial international involvement – be passed during this session of the HRC. Anything less could be viewed as an abdication of the issues that Washington has been championing in Geneva for the past several years. Sri Lanka at the UN Human Rights Council: What Now? With the long-awaited report on Sri Lanka’s violent history finally out, what’s next for Colombo at the UN Human Rights Council?